A critical aspect of network and application performance visibility is scalability, as it directly determines how much of the network and application can be monitored. It’s also a key element in planning for the future as traffic volumes rise and application counts increase. SkyLIGHT PVX delivers industry-leading, real-time network and application performance analysis with near limitless scalability. SkyLIGHT PVX traffic capture and datastore appliances integrate with any type of IT environment, from remote to central locations, across hardware, virtual, cloud, or software-defined infrastructure. See the SkyLIGHT PVX solution overview for a full list of appliance specifications. SkyLIGHT™ PVX identifies, classifies, and measures all network flows and all application transactions in real time. Every detail of every application session is analyzed—at over 10 Gbps per capture appliance with support for 40 Gbps links—with zero impact on production traffic. SkyLIGHT PVX continuously measures network health, application response times, and transaction details. Diagnosis of end-user complaints can be performed without any manual packet analysis. An intuitive interface reduces drill-down from business level views to detailed network, TCP transport and application levels within a few clicks. Having both network and application performance metrics available in a single solution and interface significantly accelerates application and network performance diagnostics. Current performance issues can be compared to historical data on a daily, weekly, monthly, or yearly basis to accelerate troubleshooting and resolution. Historical data can be retained for up to two years to help in identifying long-term usage trends. Retention of long-term statistical analysis typically requires terabytes of storage. This data must be retained over extended periods of time to expose overall trends. 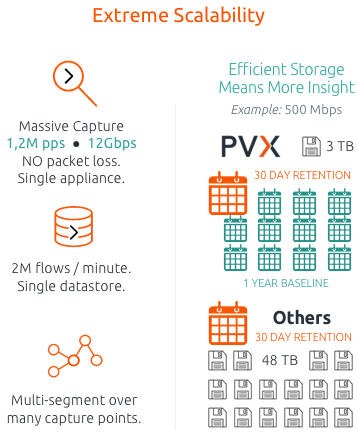 To minimize storage requirements while still making it possible to reveal trends over weeks, months, or even years, SkyLIGHT PVX summarizes historical data automatically using an efficient, aggregation process. The result is complete look back details in a fraction of the space consumed by stream-to-disk systems. Whenever SkyLIGHT PVX displays a chart or a table, it calls upon data that has already been aggregated. To display the requested information, SkyLIGHT PVX first determines the required level of aggregation granularity to use, depending upon both the length of the reporting period requested and how far back the available data goes. The result is answers in seconds, where other solutions take minutes, hours, or days to return results. Wire data is analyzed at microsecond intervals when computing performance metrics. This offers exceptional accuracy, providing the ability to detect short term degradations that would otherwise remain undetected. Performance metrics and detailed transactions are losslessly relayed to the datastore every 60 seconds. Once a given level of granularity has reached capacity, the oldest data is automatically moved to the next level in a process that is completely transparent for the end-user.